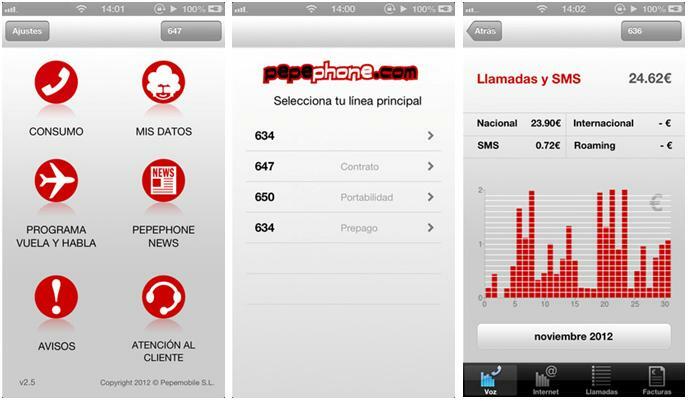 Pepephone, one of the mobile companies most successful in recent months, has updated its official app, My Pepephone, to version 3.0. This new version brings new features such as touch gestures to navigate more comfortably and easily by the application and new options for downloading documents. It also corrects minor errors that had appeared earlier in the year. Added Touch transition between screens consumption (voice and data), call details and invoices. Now you can navigate between these screens by a swipe gesture (swipe). Ability to download all invoices to the terminal. Download and deleting invoices from the invoice list. Corrigendum concerning the beginning of the new year. Feel free to download (or upgrade) if you have not done yet. Extremely helpful and personally recommended.